California Rep. Maxine Waters, the Democrat known for her “Impeach Forty-Five” chants, does not like it when anyone does not bow to her. Drunk with power Waters bullied Mnuchin, who told her he had an important meeting to go to, and he told her where she could do with her gavel, Fox News reported. At the end of a three-and-half-hour testimony before the House Appropriations Committee and Financial Services Committee, which is chaired by Waters, Mnuchin interrupted the hearing to remind the committee of a prior agreement that he would be able to leave by 5 p.m.
Mnuchin said that he was scheduled to meet with a senior official from the Bahrain government. After running overtime, he said he would be willing to stay until 5:15 and return at a later date to testify before Congress. “It will be embarrassing if I keep this person waiting for a long period of time,” Mnuchin said. His departure, however, did not come without a heated back-and-forth with Waters. Rep. Maxine Waters: "This is a new way and it's a new day. And it's a new chair. And I have the gavel." “Unfortunately, we are all pressed for time,” said the California congresswoman, whose committee grilled Mnuchin about his plans to respond to Democrats’ requests for access to President Trump’s tax returns. “If you’d wish to keep me here so that I don’t have my important meeting and continue to grill me, then we can do that,” Mnuchin said. “I will cancel my meeting and I will not be back here. I will be very clear if that’s the way you’d like to have this relationship,” he said. “You’re supposed to take the gavel and bang it,” he told Rep. Waters, who apparently is unaware of how to do her job. “Please do not instruct me as to how I am to conduct this committee,” she told him. But his staff informed him he could leave and that is what he did. "You are ordering me to stay." More from Mnuchin-Waters exchange today. Mnuchin says he's gotta go, prompting Waters to say: "If you wish to leave, you may leave." 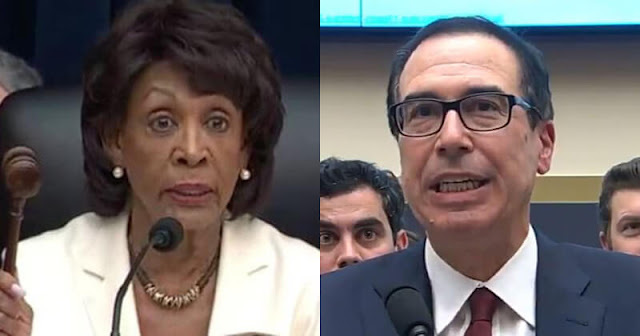 Mnuchin asks Waters to bang "the gravel" to dismiss hearing. "Please do not instruct me as to how I am to conduct this committee," she said.